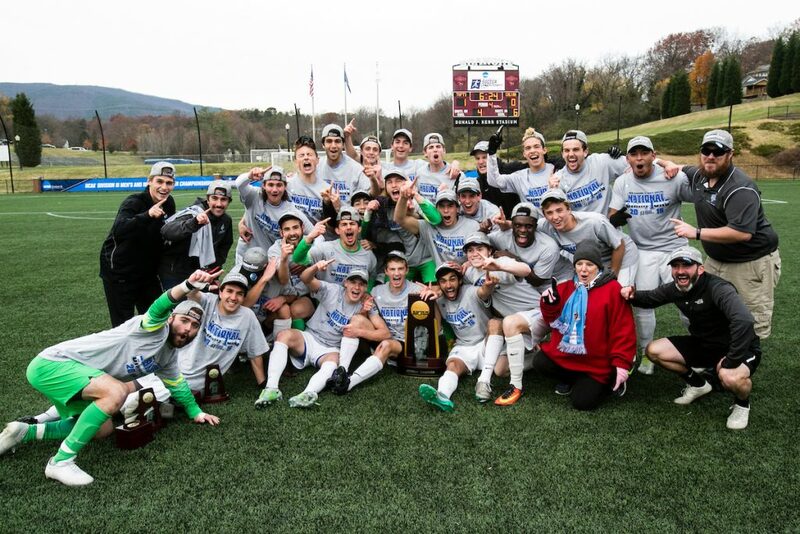 Despite almost missing out on the NCAA tournament, Tufts was crowned Div. III National Champions for the second time in three years on Saturday. Tufts defeated the University of St. Thomas Tommies in the semifinal on Friday and the Calvin College Knights in the final on Saturday in Salem, Va. The members of the six-man senior class, who were part of Tufts’ previous championship team in 2014, finished their college careers on a high note during this final win of the season. There was a chance that the Jumbos would not have had an opportunity to compete in the NCAA tournament at all, having been bumped from the top-25 in national rankings after losing in the NESCAC quarterfinals. Tufts entered the NCAA tournament 9-5-2 and tallied the second-fewest wins in the tournament, ahead of only St. John Fisher, which was 6-9-3 and was eliminated in the first round. The Jumbos won six straight games, five of which were shutouts, to eventually claim the title. The team flew to Virginia on Wednesday ahead of the semi-final match on Friday. No. 8 St. Thomas boasted a 20-1-3 record ahead of Friday while Tufts was 13-5-2. However, St. Thomas had never been in an NCAA semifinal before. The Jumbos opened the game aggressively on the attack. Sophomore defender Sterling Weatherbie’s shot forced Tommie sophomore keeper Aidan Hogan to make a save at 2:16. In the ninth minute, Weatherbie and senior midfielder Kevin Lawson each took a shot within three seconds of each other, both of which Hogan stopped. The Jumbos opened the scoring in the 39th minute when junior defender Stephen McMillian scored the first goal of his Tufts career. From 45 yards out, McMillian lifted a shot high over the heads of everyone, including Hogan, who jumped but missed the ball after the wind made the ball dip lower than he had anticipated. The Tommies closed out the half having taken five shots, three of which came after McMillian’s goal. Senior goalkeeper Scott Greenwood turned away all five shots. In the second half the Tommies outshot the Jumbos eight to six. The Tommies had three consecutive corner kick opportunities early in the second half and five shots in the first 15 minutes, but they couldn’t capitalize on any of these opportunities. In the 60th minute, senior co-captain Zach Halliday and his younger brother, junior midfielder Kevin Halliday, connected to score the game-winning goal, the first such connection of their careers. Kevin Halliday sent in a well-placed cross to his brother, who was wide open in the middle of the box, and Zach Halliday was able to send it past Hogan. The Tommies reduced the deficit to one in the 72nd minute after senior defenseman Johnny Mulvahill scored a header off a corner kick, but they could not score an equalizer. Each team took two shots apiece in the remaining 20 minutes and at the final whistle the Jumbos emerged victorious 2-1 to head to the final. Tufts’ final opponent of the season, No. 16 Calvin, was an NCAA finals veteran, having lost in 2009 and 2011. The Knights defeated the unranked Brandeis Owls 1-0 on Friday to advance to the final with an overall record of 23-2. The Jumbos controlled the game early on, with an extended offensive possession that saw them take four shots in the first 13 minutes. However, the flow of the game shifted, and Calvin took possession for the middle of the first half, putting extended pressure on the Jumbos defense, taking five shots in that period, and seven overall. In the second half, the Knights outshot the Jumbos 6-5, but neither team was able to score. There were close opportunities from both sides, with Greenwood making a miraculous save off a point blank shot, and Knights junior keeper Nate Van Ryn picking the ball off the goal line to keep his team in the game. The ball spent a considerable amount of time in the middle third because both teams’ defenses played well. As a result, it took over 100 minutes to get the first goal. For Calvin, which averages over three goals a game, the Tufts defense provided a serious challenge. However, Tufts is used to playing low scoring games having won 1-0 three consecutive times in the tournament prior to the semi-final. In the first overtime Tufts was the controlling force, taking two shots to none for Calvin. However, the game still needed a second overtime to determine a winner. Three minutes into the second overtime, Kevin Halliday made his second assist of the weekend and sixth of the season when he sent junior midfielder Tyler Kulcsar a good ball from a corner in front of the goal. Kulcsar managed to get a foot on the ball near the back post to score his first goal of the season, a game-winner in a national championship game. Kevin Halliday has shone throughout the season, and has stepped into a key role as one of the team’s main playmakers. As a result of being an offensive midfielder, he, junior midfielder Dexter Eichhorst and first-year midfielder Brett Rojas were often aggressively man-marked. Over the weekend, the ball was played out wide more often than usual because Kevin Halliday was so tightly marked in the middle. This was an unexpected ending to the season for the Tufts team after it started the season losing two games and drawing one. Over time, with one of the best defensive units and goalies in Div. III, Tufts tallied 13 shutouts out of its 15 wins this season and conceded only one goal in the other two wins. Five of these shutouts came in the NCAA tournament alone. Following the win, the team bids farewell to six seniors, all of whom were integral to the team. Zach Halliday was a dominant leader and his counterpart, senior co-captain forward Nate Majumder led by example. Zach Halliday scored the game winner against St. Thomas, while Majumder scored game winners in the second round and the quarterfinal round of the NCAA tournament. Zach Halliday earned All-New England Regional Third Team honors as well as All-NESCAC second team recognition. Senior defender Daniel Sullivan consistently controlled the back, making sure the defense communicated in order to protect the goal. Sullivan was named to the All-New England Region Second Team and the All-NESCAC first team. Another player named to the All-NESCAC first team was senior forward Gaston Becherano who had his best season yet, as the Jumbos’ leading scorer with 12 goals, second in the NESCAC conference. He was named NESCAC Player of the Week after scoring two game winning goals in one weekend. Becherano’s achievements this season also earned him All-New England Region First Team, and 2016 NSCAA NCAA Div. III Men’s All-America Third Team. Lawson was an important force in the midfield for Tufts. After stepping up this season to fill large shoes left behind, he came into his own as a key anchor in the middle third. Lastly, Greenwood was a four-year starter for the Jumbos and played a role in the team’s NCAA tournament run, tallying 10 saves over the weekend. Together, the senior class contributed to a 50-17-11 record (24-8-8 in the NESCAC) over its tenure. Shapiro agreed that the team as came together last week to prove its abilities on the field and as a group.